SILOMAT® is a mechanically consolidated non woven fabric made of continuously drawn basalt fibres which are thermally stable up to 750°C. 130 to 170kg/m³, thickness of the fabric is 6 to 25mm. No toxic gasses are emitted. 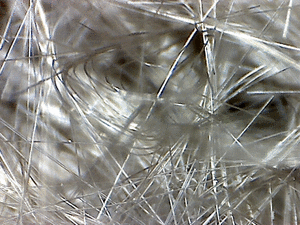 The fibres do not enter the lung as its diameter amount from 10 up to 17µm. SILOMAT® is available as fabric of 100cm width, as cut parts or as stamped parts. SILOMAT® is ideal for thermal as well as for acoustic insulation. Furthermore, it is used for absorbing excessive noise in areas of high temperatures.